Since I started astrophotography, deep sky imaging has always been my true passion. And that’s as true today as it was back in 2013 when I got my first horrible shot of the Whirlpool Galaxy that utterly blew my mind. There’s just something about capturing photons that have been travelling to us for millions of years that has an appeal I can’t quite describe. I almost feel compelled to do it. The last year saw me improving my skills quite remarkably. From capture to post processing, my technique has improved. New equipment such as an Explore Scientific ED80 and a Nikon D750 have added some welcome new tools to my arsenal that are largely responsible for me “widening my horizons. First, there my new telescope. I purchased it back in the spring and through the summer, it’s been my main imaging tool. It’s small size and light weight make it easy to carry and quick to set up. It’s razor sharp, apochromatic optics and wide field of view have provided me with views of the sky I could never have achieved previously. 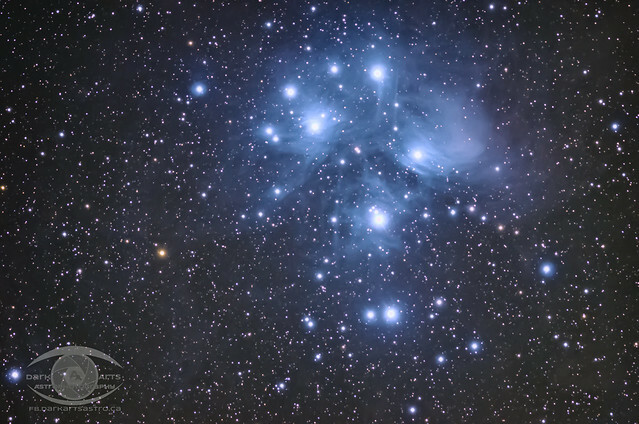 The wide view of the Pleiades Cluster seen here is a testament to the power of this little scope. I’ve repeatedly tried shooting this target with my different cameras and telescopes for the past 3 years, and have always failed miserably until now. Improved technique was definitely a part of the equation, but I attribute this image directly to the telescope. 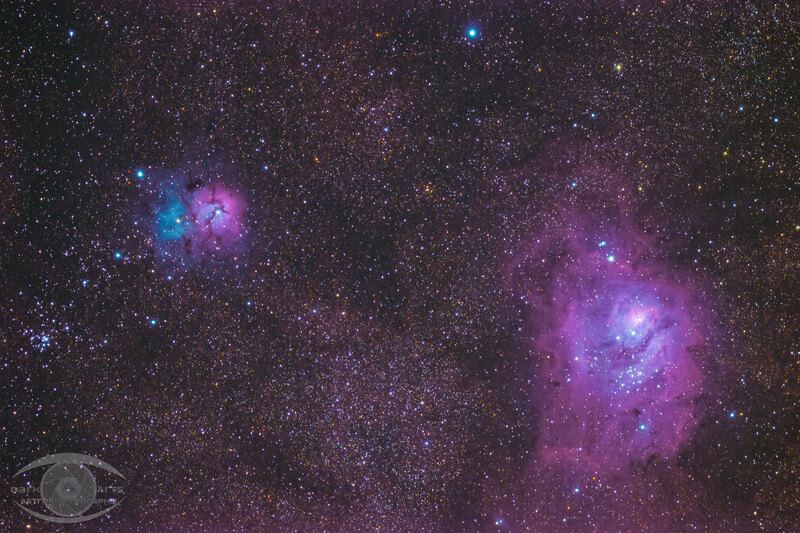 Another such success that I would never have been able to pull off before is the image of the Lagoon and Trifid Nebulae seen below. The level of detail and incredible colours in this picture are a direct result of this fine little telescope. What really started (literally) widening my horizons was the purchase of my 13mm Vivitar lens a year and a half ago. At that point, the widest lens I had was a 35mm, that on a crop sensor was really a 50mm. I discovered that widefield landscape astrophotography was a new challenge that I was enjoying. It wasn’t until I got a second camera body early in the summer of 2015 that I really started experimenting with it. When I go out to shoot, generally, it’s with the scope, and that requires my camera attached to the scope. The “new” used Nikon D5100 became my dedicated telescope camera while my D7000 became dedicated to shooting widefield images. I shot a LOT of images through the summer of 2015. Unfortunately, most were not very good. Sometimes it was location. Sometimes it was conditions. Sometimes (mostly), it was just me not really understanding how my camera worked or not having enough of an artistic eye. I did get some good shots, but like my early deep sky imaging days, I had far more failures than successes. But through sheer perseverance and trial and error, by the end of the summer, I had learned to properly use my camera, and I had developed more of an eye for photography. That’s when I purchased a new Nikon D750 and a couple of wide angle lenses – a Nikon 24-70 f/2.8 and a Tokina 16-28 f/2.8. The result of my first time shooting with the D750 and Tokina lens can be seen at the right. I knew from the first shot that this was just what I needed. Now equipped with a full frame camera, I was getting wide fields of view that were never really possible before. The improved sensor also allowed for better noise tolerance at higher ISO settings, and I could now also take longer exposures, giving me far brighter and more detailed images than were possible before. Since then, whenever I’m out shooting deep sky, I will usually be actively using one or both of my extra cameras actively shooting widefield images. And sometimes now I just go out with my 2 main cameras and leave the scope at home. These trips out have gotten me some amazing images like the image at the top of this post. After successfully experimenting with some time lapse photography back in late summer 2015, I’ve now taken this up as a more regular practice. 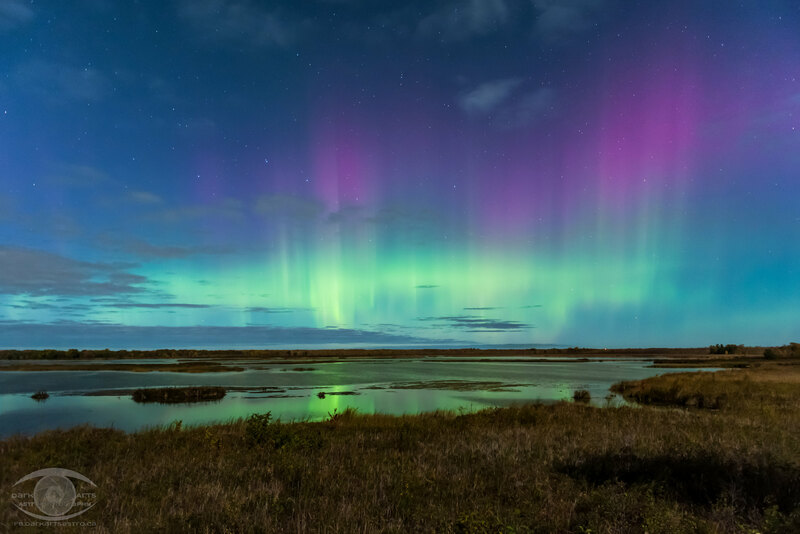 I’ll quite often have 1 or 2 camera set up shooting time lapse sequences of star trails, the Milky Way, or when it’s visible, the aurora borealis. The latter I got to shoot several times in the last year. 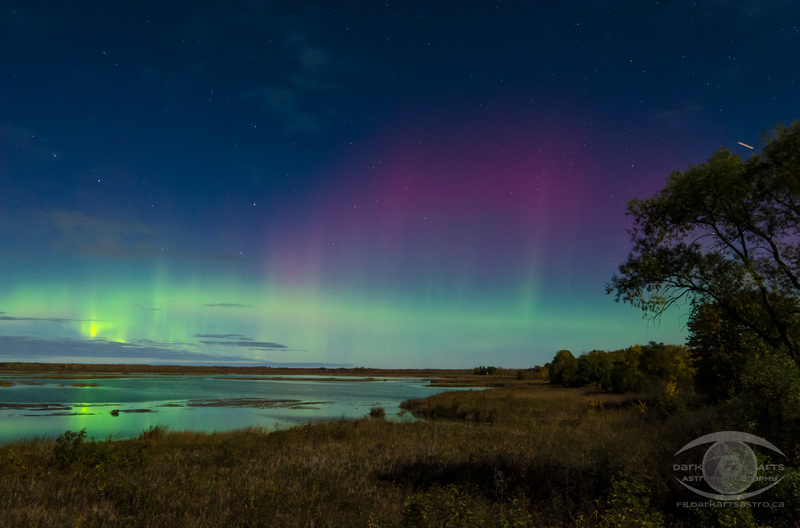 Last fall proved to be quite active with several strong solar storms producing very active aurora. Processing thousands of pictures from a single session into a short video has proven to be quite a lot of work, but I would have to say that it’s been worth it. I love seeing the motion of the sky over hours compressed down to a few minutes, particularly when the aurora is dancing across the sky as can be seen in this video I shot back in November 2015. In no small part, I have to thank my good friend and photographer extraordinaire Adam Correia who really got me started in widefield landscape astrophotography. It was with his expert instruction that I finally clued in to the things I had been doing wrong previously. 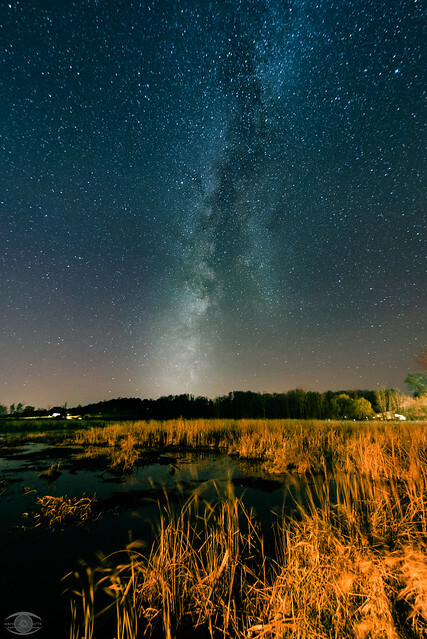 On our first night out shooting together, after a couple of hours of his expert instruction, I managed to capture the image that won me the 2015 Shoot The Stars contest as seen on my Awards page.